Sample no. 5457 from the "Mineralogy and Petrography Museum Grigore Cobălcescu" of "Alexandru Ioan Cuza" University, Iaşi. Below spectra are various settings, and other vibrations of aurichalcite (which are not present in this spectrum). The Raman spectrum of aurichalcite is different from those of malachite and azurite. This spectrum has a characteristic intense band at 1069 cm-1 which is assigned to the ν1 symmetric stretching mode of the carbonate unit. The two low intensity Raman lines of 1485 and 1507 cm-1 may be ascribed to the ν3 asymmetric stretching modes. To the ν4 mode (doubly degenerate symmetric bending) are attributed the values of 706 cm-1 (ν4a) and 733 cm-1 (ν4b). 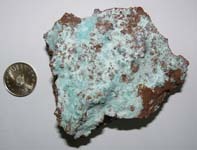 A number of bands with different intensities are observed in the lowest spectral shift of the aurichalcite Raman spectrum (285, 388, 430, 461 and 498 cm-1). These Raman lines are assigned to the CuO and ZnO stretching and bending vibrations (Frost et al., 2007). A single band of the OH-stretching modes is observed at 3344 cm-1.